In No Hacker's Sky you're a space enthusiast, who also happens to be a skilled hacker. It's set in the future, where a huge space mining corporation called Extrasolar Mining Corp (EMC) has deployed probes, satellites and manned stations on distant planets and moons. 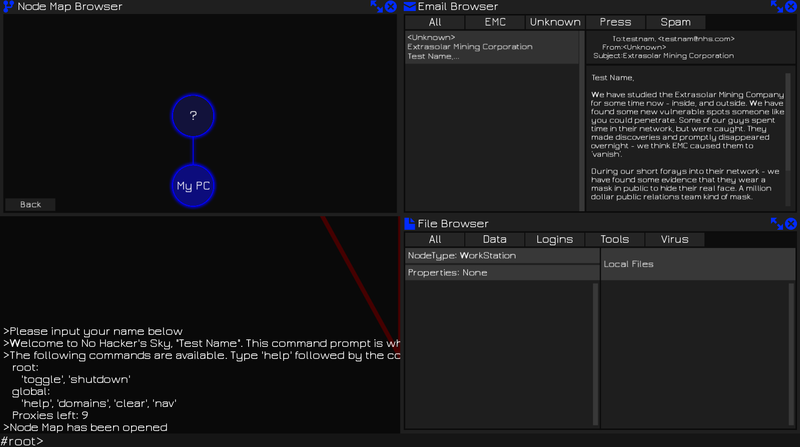 You are contacted by a group called Unknown to hack into the EMC network to find out what is going on. Here's where the game begins. 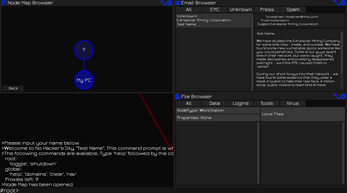 You use the in-game command prompt together with the "node map" to hack into EMC's network. You start by poking for weaknesses, exploring the network for emails and passwords, eventually gaining access to offworld drones. Look for evidence in documents and emails, and while using their drones you can look for signs of what they have been hiding. 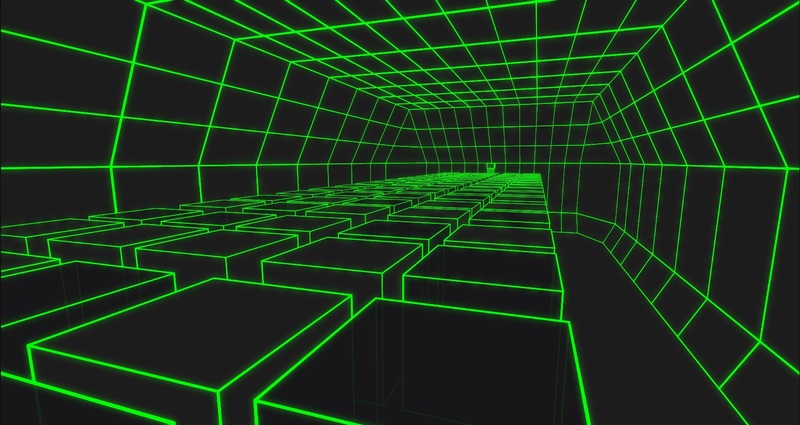 To access nodes you either have to provide certain password files, or clear 3D visualized puzzle worlds (19 of them). 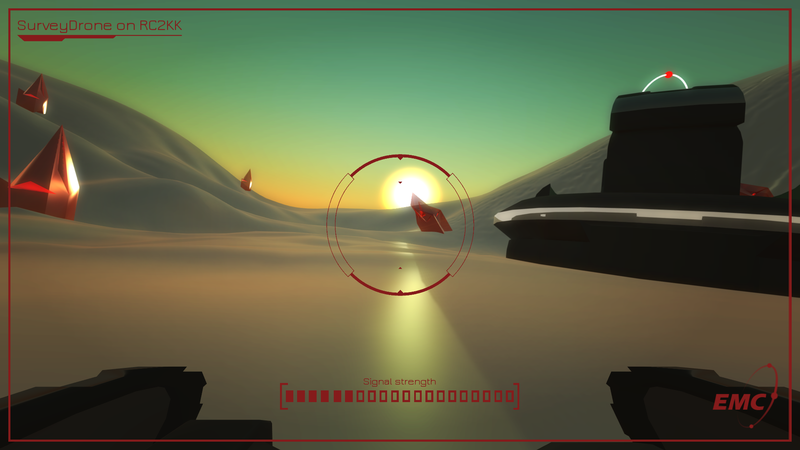 You'll even get to explore a couple of planets near the end of the game (screenshot 4 is one of them). "In No Hacker's Sky you play a skilled computer hacker who is attempting to uncover an interplanetary conspiracy using a mixture of basic command line prompts and first person puzzle solving. To open nodes, you must first open the node map by writing in the command "toggle nodemap". What you see then is the main node map, with different network nodes. These network nodes hold a sub node map, where the nodes are essentially individual systems. To open network nodes, click on them. The network nodes with a "?" on them aren't accessible, so you can't open them - however, the system nodes with a "?" on them can be opened (which is very essential), and then hacked by either password or a node world. You can move the node map around my dragging it around. To go back to the main node map that shows network nodes, just click the little "Back" button. Enter : Call commands (if the input field isn't already focused, this will focus it). 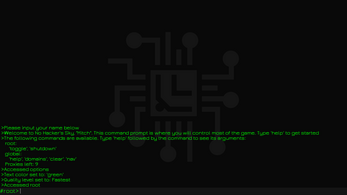 TAB : This scrolls through commands, including their arguments. If you write a bit of a command and press TAB, it will try to find one that matches (even if you just write a bit of an argument). Holding Shift while pressing TAB will go the opposite direction, this means you can go back if you accidentally scroll past the command you want to call. Arrow Key Up + Down : This scrolls through previously called commands. You can move and resize windows in the same way you would with a normal operating system. To use tools, drag them to the other pane in the file window. To avoid confusion about using tools, click here to see how to use them. To use passwords, you have to drag them to the little area saying "Password Required". (Planets) Escape : Open command line that'll let you write "exit" to exit planet. (Node Worlds) To unfocus a terminal, either look away or press Escape. (Node Worlds) Type in "exit" in any terminal (there may be some exceptions) to leave the node world. (Node Worlds) The "Home" key restarts the level. Sometimes needing to push 'T' multiple times on a drone to log an evidence piece. In falling puzzles, you can sometimes stick to the wall to stop falling. In falling puzzles, sticking to the wall sometimes propels you into the air. If you hit a corner in the right way in a maze or drone - it flings you into the air. 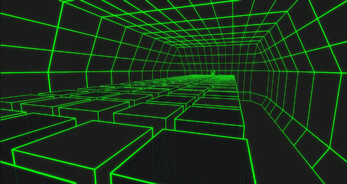 Press home to reset in the maze when you are flung upwards. Tools cannot be used if the node hasn't been hacked/unlocked. Hint: You can click on email notifications to open the new email. Hint 2: If you seem to be stuck - remember to use the Hound tool frequently. It will show hidden places and also reveal traps. Rogue can only be used on known tripwires. Hint 3: There are only three viruses but many more honeypots. Use them wisely. 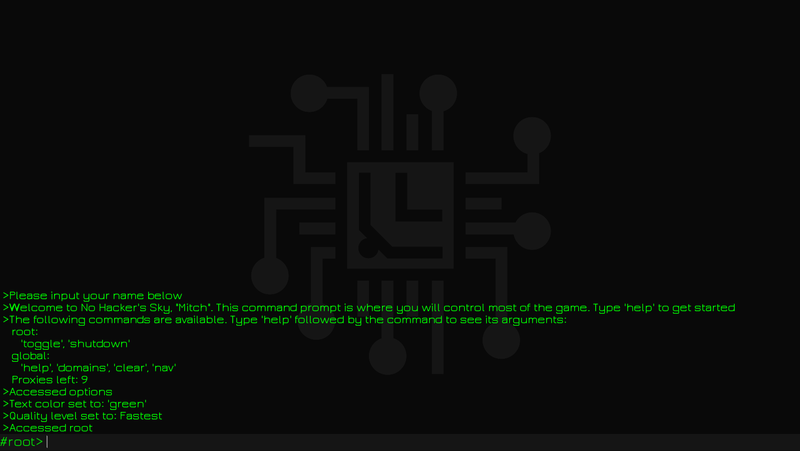 Hint 4: 'help' to get commands and see how many proxies (lives) you have left. Hint 5: If you're stuck after the first four nodes, please remember to read the emails. Use Hound on the node "Hub" and the hidden node will be shown. When you reach the end node in that network, click the "Back" button on the node map to go back to the main node map. Hint 6: Please read emails carefully, sometimes you get important info from them (especially in the first node network). Hint 7: To use tools on nodes, you need to have access to them. Hint 8: Keep in mind you can drag the windows around, as well as resize them (just like you would in Windows, OS X or Linux). If you are careful you will finish the game, if you are careless you will perish. This game was made in about 20 days for an online game jam called "Mix Tape" held by the /r/IndieDev subreddit, with the theme of "Exploration". It was held in collaboration with the No Man's Sky subreddit, hence the name "No Hacker's Sky". I'm experiencing an issue. i am stuck on the left of the first of the nodes on CEO, somehow i was catapulted above the maze and while attempting to get back down i fell off the map. is there a way to respawn or exit the level without restarting the entire game? I'm intrigued by this game, but for some reason all of the buttons on the boxes such as the email list are not where they should be, I have to move my mouse way off to the left to actually hit the exit button. Any idea on how to fix this? for some reason the game wouldnt let me quit and I tried turning my laptop off but now it’s stuck? do you need hacking experiance ? I've been stuck for way too long on that one level at the start where you must choose the paths. Unless there are some sort of solutions somewhere, i'm not gonna try and keep going again, too much frustration killed my will to keep trying that path level. Until i find some walktrough or you tell me how to do that, i'm just gonna stop here. The start of the game took a minute, clicking around the nodes to find the initial email, which "emailbrowser" is a lot of useless extra to type by the way, and it wasn't very intuitive how to use the tools. You have to drag them to the other side of the window, but it's not really clear how to detect tripwires and honeypots. There's no pattern to really help the player establish what looks "too sweet" when starting out your goal is to download everything. It could be a good game, but it lacks in player empathy to be playable. What do I do, i can click in the node map. The game's just a buch of commands towaste your time. "Welcome to No Hackers Sky. Type help to see a list of commands." "Unknown Command. Type help for a list of commands"
great game, but I faced some bugs like decelerated after drop from air(include jumping,it is fine through jump again to gain acceleration) and goes through a black hole in the CEO Maze Node.